We arrived on the Ghan Train in Adelaide's Keswick Railway Station about 9:00 a.m. The sky was overcast. We took a bus tour of the city and the surrounding Parklands, then had some time to explore the downtown area. We went to the South Australia Mseum and saw the largest collection of Aboriginal artifacts so far. They also had many more exhibits. It was a great museum and free. Some flowers along North Terrace. For lunch we stopped at Glenelg near the beach. We were headed south through the McLaren Vale where we stopped for some wine tasting. 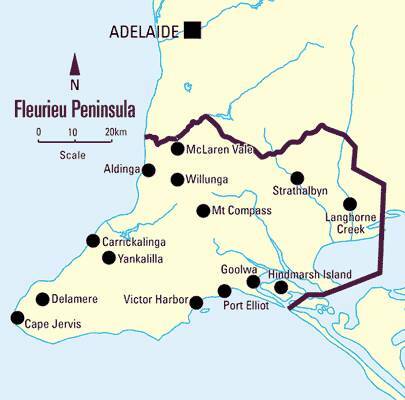 Adelaide is distinguished as the wine capital of Australia, with six of the nation's top ten wines made within a few hours drive of the city. We continued south on the Fleurieu Peninsula with a stop at Victor Harbour before continuing to Port Jervis to board the 6:00 p.m. ferry to Kangaroo Island. The ferry ride was only 45 minutes but seemed much longer because of the rough sea and most people having a queasy stomach - including us. A few people on board actually got seasick with vomiting. We sat in the front of the ferry (we heard that was the worst place in rough water) by the snack bar. Nobody went to the snack bar. Another adventure awaits us on Kangaroo Island.